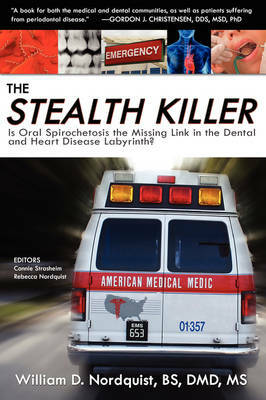 I believe the book, The Stealth Killer: Is Oral Spirochetosis the Missing Link in the Dental and Heart Disease Labyrinth? is very relevant and important not only for those of us with Lyme, but for everyone. It's definitely informative and seriously worth the read in my opinion. Dr. William Nordquist, DMD, connects a big dot between spirochetes and many chronic diseases, including periodontal, cardiovascular, and neurological diseases. Many of my major health problems began after having oral surgery in 1994. I did have an optic neuritis prior in 1992 but the etiology could never be fully explained. The reason for the surgery was to remove an abscessed portion of bone from my maxilla (which interestingly was on the same side as the neuritis). Actually, there was more bone abscessed than the surgeon could initially tell from my x-rays. Of course he later discovered this fact during the actual surgery. Afterwards, I felt very ill. In fact, my recovery did not go well at all. I tried returning to work two weeks later but ended up taking a medical leave of absence for over two months because I was just too exhausted, sick, and debilitated. I couldn't physically function. After several rounds of labs it was believed I had developed mono (Epstein-Barr) following the surgery, which was true. This was thought to be the sole reason for my feeling so badly and that I would recover in time. Little did I know; it was only the beginning. I've never felt the same since. And I've had so many questions. Nineteen years later, I still have many questions. Yet I began digging even deeper after discovering chronic Lyme was at the root of my illness a few years ago (of course we all know the complicating problem with undiagnosed or misdiagnosed Lyme disease is that it becomes chronic or persistent Lyme with multiple co-infections. And that's not even taking into account the weakening or damaging of cells, organs and systems that occurs through the many taxing months and years of untreated chronic infections and inflammation). Were oral spirochetes responsible for the abscess in my jaw? Was Borrelia burgdorferi (Bb), the Lyme bacteria, already present in my system before the surgery? Or other vector-borne bacteria or viruses for that matter? Did the invasiveness of that initial surgery (I had two other subsequent surgeries a few years later due to complications but that's for another time) suppress my immune function, which in turn allowed the release of spirochetes more systemically? I have my own thoughts about all of this. I've found some solid answers along the way but I also have my arrived-at-answers too. You know, piecing together certain parts of this health puzzle yourself and arriving at the most apparent answer. Sound familiar? And then there are those questions that still remain. And perhaps they'll always remain. I'm not sure I'll ever find complete answers for them. Sound familiar too? According to Dr. Dietrich Klinghardt, M.D., Ph.D., one of the many presentations of Borrelia, as well as Babesia and Bartonella (two other tick-borne bacteria), can be "non-healing infections of the jaw bone, devitalized teeth, and dental pain." The more I've researched, the more I've discovered that Borrelia (Lyme) spirochetes, among many things, like bone. A lot. Particularly bones of the jaw and hip. They seem to have an affinity for it. I've heard through the grapevine, if you will, some stories of others with Lyme disease who also had bone infections (osteomyelitis) of the jaw and/or hip. I directly heard a woman tell the story of her mother who had spirochetes eat through the head of her femur to such a degree; she had to have a hip replacement. And then the spirochetes began eating through the plastic part of the implant. Crazy! This is what led me to find Dr. Nordquist's book, The Stealth Killer. Of course, it is written from a dental viewpoint but that's precisely the point. Among many things, he discusses how all spirochetes, including oral spirochetes and Borrelia, the causative agent of Lyme, share similar, if not identical, survival strategies. Very interesting, don't you think? When I first started reading it, my mouth dropped open. No pun intended. It spoke to me on so many levels because of the previous dental and jaw bone infections I'd had, as well as a heart arrhythmia I developed several years later. The arrhythmia continually grew worse over the course of a two year period and we had no idea then what was causing it. In the meantime, Lyme came into the picture. Long story, but once I started on a Lyme treatment (specifically beginning with Borrelia Remedy Series Therapies from Desbio); the arrhythmia totally subsided. It took about three months for my rhythm to completley correct itself but it surely did. That's when my doctor and I both knew the Borrelia bacteria had gotten into my heart tissue and was the source of this mysterious arrhythmia. Dr. Nordquist has also co-written another relevant book that I've yet to read but plan to, The Silent Saboteurs: Unmasking Our Own Oral Spirochetes as the Key to Saving Trillions in Health Care Costs. On a side note, Dr. David Jernigan, DC, wrote an interesting article entitled, Are You Harboring Bacteria in Your Teeth? that bears witness to this discussion. Beyond daily brushing and flossing, he recommends using a Waterpik Waterflosser Ultra with purified water and a cap full of Thieves Mouthwash, the highly anti-bacterial/anti-viral/anti-fungal essential oil blend, to eliminate many bacteria in the mouth including Borrelia. This I have tried and like. Dr. Douglas Martin, DDS, recommends brushing with baking soda and using a Waterpik with Dakin's solution (1 part Clorox to 20 parts water) to eradicate spirochetes, an oral care regimen advocated by Dr. Jurgen Slots, Ph.D., head of the Periodontics program at the University of Southern California. Click here to read more. While I often use baking soda to brush, I've never tired the Dakin's solution. Anybody? I share all this because I absolutely believe that spirochetes have played a role in my health problems from the beginning. I know there are many who've had similar experiences. And this isn't only a Lyme disease issue. I wonder how many people with Alzheimer's or arteriosclerosis or congestive heart failure or MS or gingivitis actually have a problem with spirochetes of some kind? Believe me, I clearly know and understand there are usually many factors that play a role in the development of chronic illness. But I also believe there are key triggers involved in the process, including spirochetes. Knowing they have the ability to evade detection by the immune system and still cause major havoc in the body unbeknownst to the average person, including many doctors, is what makes me want to share this even more. I'd say stealth is a spot on description. I sincerely hope and pray the dental and medical fields will awaken more to this truth. And perhaps in doing so, more lives can be spared the tremendous suffering, debilitation, and loss that comes with pathogenic spirochetal infections like Borrelia, including oral spirochetes. I'm certainly not advocating living in fear. That is no way to live. I won't. One has to choose to live in hope because despite all the difficulty, suffering, and uncertainty; there is always hope for something better. And there are those wonderful doctors, researchers, scientists, and advocates who are diligently working for this very thing - something better. You and I are working for something better too; a better life for ourselves, for our loved ones, and for the next generation. I have to keep hoping and believing. Let's hope and believe together. P.S. If any of you have had similar experiences that you want to share, I'd love to hear about them. I'm so glad to have found your post as I am suffering from lyme in my mouth. I have constant sensation of numbness and pain to all the teeth on my left of the mouth and the left side of the tongue. I had a root canal back in 2010 then in 2011 I was told the root canal cracked and had the tooth extracted and the jaw bone was graphed for an implant to happen in the future. Well I never felt well enough to get the implant. My jaw bone feels the same as my teeth that are numb and in pain. That jaw bone has even dropped and looks different. I've been to lyme dentist who said he couldnt do anything because the xrays look like the extraction healed fine. I've started my lyme treatment 3 weeks ago with a protocol of abx and supplements and my mouth still is the same. I can't find anyone who has any idea what to do. So I am thankful to have found your post, but sorry that you have lyme too. Were you able to get the lyme out of your mouth? If yes, what did you do? Any help is appreciated. Jennie, I'm so sorry to hear of all you’re suffering with Lyme. I am very glad to know you've started treatment. Lyme can easily disseminate throughout the body and become a systemic infection. So therefore, systemic treatment is vital. I don't know if any of this alone is the answer for all the pain and numbness you’re having. I personally think your overall Lyme regimen is what’s necessary and not just an oral treatment because again, Lyme is systemic. Are you having other symptoms? Sometimes, other tick borne infections like Bartonella can also cause a lot of dental pain and oral problems. My issue might have been different in that my body rejected the synthetic bone filler the surgeon used to replace the abscessed bone. My jaw continued to be bothersome for quite a while after that first surgery. My dentist kept telling me the site looked good and healed but I kept complaining because it continued bothering me a great deal. Eventually, I had two other subsequent surgeries to remove it. Another surgeon replaced the synthetic filler with a natural seaweed filler and it's been alright since; although I think scar tissue is an issue because it doesn't feel exactly the same. This was all long before I knew I had chronic Lyme. In hindsight, I personally think the Lyme bacteria was in my body even then and have often thought it was most likely responsible for the abscess. I wish I had a good, easy answer. I think different things work for different people. I know you just want relief. And I want that for you. You might want to give the Thieves Mouthwash a try. It couldn’t hurt. My heart goes out to you because I know how badly this makes you feel and how much pain it causes. Even though this is a difficult, lonely journey, please know you’re not alone. I will keep you in my prayers, Jennie. I so hope you find relief soon. Please keep in touch. I'd like to know how you are. Much love to you. I've typed 2 responses and both lost on pc. long overdue thank you for your reply to me, shortly after posting my young son was dx with lyme, my only excuse for not replying soon. my teeth jaw pain has escalated. started on rifampin for bart 2 wks ago & increased dose 4 days ago, hoping it may help if pain from bart. 3 dentists looked at my xray of where bone was filled with bovine filler and all said healed fine. wondering if xray really would show underlying infection or if I need a cone beam or therogram. hope you are well. you are in my prayers too. I will keep in touch, please do the same. I look forward to hearing from you. I love your blog very informative and helpful. So good to hear from you, Jennie! I've thought of you often, wondering how you are, since you first left a comment back in the summer. Oh my goodness, I'm so sorry to hear that your son has Lyme also :( No need for apologies or anything of the sort. I'm quite sure you've had your hands full between his diagnosis and treatment as well as your own. I'm also very sorry your pain has increased. It can be so frustrating I know. Perhaps there is an underlying infection. It might be worth looking into. I'm not sure if you've ever used or are familiar with homeopathy, but I use a homeopathic remedy called LYM (Deseret Biologicals) as a supportive part of my treatment and it really helps me with certain things, mostly Lyme-related headaches and fevers. It isn't a cure all but it does make a difference for me. I wonder if it might give you any relief? I know different things work for different people and I would never push anything on you. I have an extra bottle and would be more than glad to send it to you (on me, of course) if you might want to give it a try. I actually wrote a blog about it before my recent update. If you're interested, you can email me. Just go to the top of my blog and you'll find a mail icon beneath my pic on the right. Again, no pressure whatsoever. Just thought I'd mention it to you and if you are interested; you can email me. Otherwise, I appreciate you letting me know how you are. Friendly support means so much, even online. I truly hope you can find some substantial relief from your jaw pain. And I hope and pray the very best for you and your son. Thank you for keeping in touch. Jackie, thanks so much for sharing this. I'm so sorry to hear of how much you've suffered. I hear you loud and clear though. I never take it lightly when someone shares some of their struggle with me. I'm sure you could probably write a novel about your long battle with all this, huh. I'm very glad you've found a biological dentist to help support you properly. I'm certainly not an expert but I do know what I've experienced and learned through these many long years of sickness myself. I wholeheartedly believe that Lyme can affect any system in the body; especially if it's gone untreated for a long period of time. It can disseminate quite easily throughout the body invading tissues, organs and cells. And I believe when Lyme becomes a chronic or long term infection it isn't only about Lyme any longer; it's more of a Lyme disease complex with other infections and dysfunctions involved. Perhaps your right about the infection with your teeth becoming systemic. It's possible it might also be rooted in the Borrelia (Lyme) bacteria. It's so hard to know for certain. I'd love to hear how you feel and progress as you work with your biological dentist. How's it going so far? Have you ever heard of MTHFR mutations? Or been tested for any? It can affect your ability to detox. It has everything to do with the methylation cycle in the body. It might be worth looking into. It can be an issue that plays a role in your overall health. I'm honored to have you following along, Jackie. I truly hope you feel better as you continue working to regain your health. I know it's more difficult than words can really articulate. And nobody can understand unless they've experienced it themselves. Take care of yourself and please keep in touch. I'd like to know how you're doing. I'm pulling for you!